We are excited to announce the date for the Flux Festival for 2018. Mark your calendars for a day of movement revelry and spectacle on: Saturday, September 22nd. Immerse yourself in a full day of games, feasting and culture making through the body. 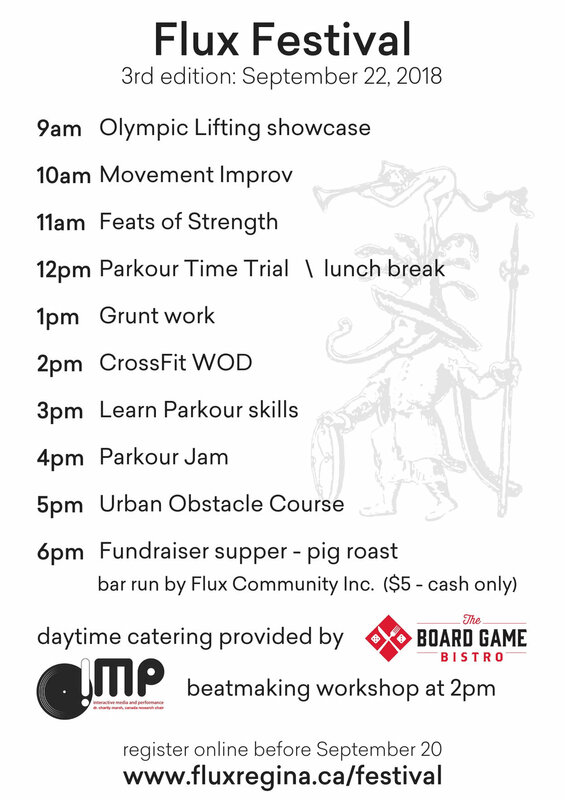 se them in a Parkour Jam - where you will learn the 10 second game in our state of the art Parkour facility. We will wrap up the Flux Festival with a licensed party including a DJ, karaoke and a fundraiser to support Flux’s urban garden with a Pig Roast put on by chef, “Masta Rand” and brother Gord. Flux will be supplying cabbage slaw. Feel free to bring a side food item only if you feel compelled to do so (not required). How can society and nature thrive together? Why should humans care about the state of urban ecosystems? The Flux Frontier offers the exploratory grounds to ask such questions. Through day to day management, the Flux Frontier is a space that will emphasize and value the kind of knowledge that can only be gained through practice, daily observations and trial and error. Our school is very fortunate to have such a large tract of land to work with and explore the question of how to create positive and life affirming interactions between humans and the natural world in an urban landscape. The majority of humans now live in an urban setting and therefore questions of what makes humans thrive in an urban ecosystem are more relevant than ever. Our hope is that the Flux Frontier will become an educational centre for urban ecology. A space where humans, young and old, can learn about ecology and the importance of growing food. The Board Game Bistro will be catering on site all day with food such as local hotdogs and snacks available for purchase (cash only). A portion of the fees raised will fund Flux’s urban garden and those that wish to donate further can do so through Flux Community Inc.'s Paypal. Teams will be created by Flux staff and athletes strategically placed on certain teams to align with the above three scoring factors. Teens are encouraged to sign up and will have their own team provided sufficient numbers.